Hello, my name is Jim Sells, the developer of several multimedia programs for Windows. Let me tell you why you should try our creation, VCRadio. First, let’s mention that there are several different models of FM radio tuners that connect to your PC. While using my computer for several hours each day, I found one of these radio tuners to be surprisingly useful for playing background music and news shows during my intense programming sessions. My productivity has gone up, and work sessions are more fun. It’s a fairly inexpensive piece of hardware that is easy to install, and easy to use. It works. I recommend it. RecAll, our recording program with a built-in timer, is very handy for recording radio shows that might be playing for those occasions when you are away from the PC. I connect the radio card to the Line-In input to my sound card, so the radio plays through the amplified speakers connected to my sound card. With one of the better compression codecs that RecAll can use, a one-hour recording takes less than 15MB, which is trivially small compared to today’s typical 4GB disk drives. Having experience developing several audio programs, I decided to create the ultimate FM radio control program. It would have built-in timers like a VCR,except infinitely easier to program. It would have built-in recording controls.It would remember your favorite radio stations and their call-signs. It would look cool on your desktop, or hide conveniently on your taskbar tray. It would keep an archive of your radio program recordings. And, since I would use it every day, it would work well, and keep getting improvements in future versions. Well, here is the result. I think you’ll like it. The Radio tab window loosely resembles a car radio front panel, with volume up(V+), volume down (V-), tune frequency up(T+) and tune frequency down (T-).Mute turns sound off/on. 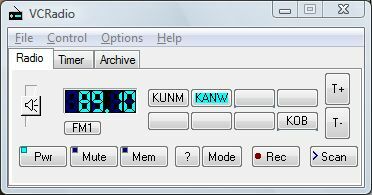 To program a radio station into memory, click on the Mem button and then one of the eight station buttons. In the Station dialog, you can specify a four-letter call-sign for your radio station, which can appear on the face of the radio station button. Don’t you wish your car radio could do that? Now let’s program a timed recording event. Don’t worry, this is much easier than programming your VCR!! Go to the Timer window tab. Click on New Event, and let’s enter the information to program a favorite scheduled radio broadcast. Now, after the recording is finished, we can find it in the Archive tab, and play it back. Move within the audio file with the Position slider. VCRadio can cooperate with our program TVactive, If you have one of several TV tuners with FM radio capability that we support. Un-mute VCradio, and the TV turns off! Turn on TVactive, and VCRadio automatically mutes!